Found one file extension association related to Sony Ericsson Theme Creator and 1 file format developed specifically for use with Sony Ericsson Theme Creator. Sony Ericsson Themes Creator is a personal computer based application that allows users to personalize the “look and feel” of the Sony Ericsson mobile phones. The application allows you to create new themes, edit an existing theme and save a theme. 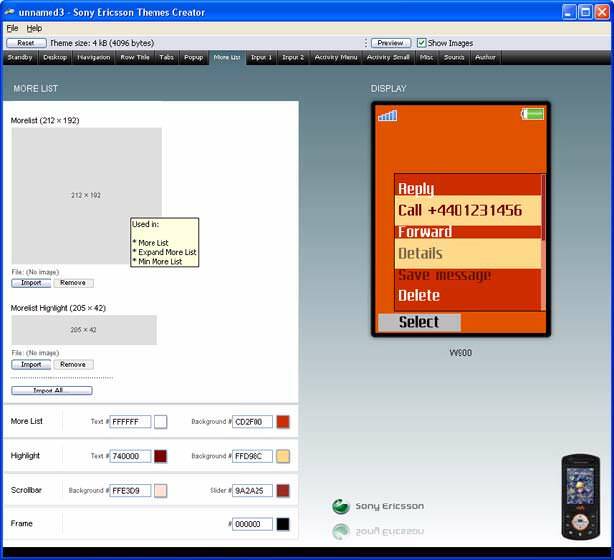 The Sony Ericsson Theme Creator application helps you to create/compose themes which are compatible with Sony Ericsson mobile phones. The application is not a graphic editing tool, but more of a “com-poser”, that is, it enables you to create a theme based on existing components (sound files, image files, and so on.). It also allows you to change display colours for menu text, clock display, and so on. In the File menu the phone model to work with can be changed, existing theme files can be opened and the current theme can be saved. The tabs are used to select group of theme elements to edit. In the example below, the Standby screen is selected. The Import... buttons are used to select images for elements. When a button is pressed, an “Open” dialog is displayed so the wanted image file can be selected and imported. Colour settings for text items, outlines and backgrounds can be entered directly into the text fields or selected via a “Colour” dialog, displayed when a colour button is pressed.Image and colour changes are immediately reflected in the preview image to the right. From Themes Creator v 3.08 a new feature has been added. When the user moves the cursor over a graphic element, a pop up shows where that element is used, as in the image below. Export empty resources. This feature allows export of a collection of image elements to a selected directory. Each image needed for a complete theme is saved in the selected directory as a .png file with the correct element size and given the correct file name. The saved collection can be used as a “template” for easy creation of all the image files needed for a complete theme for the currently selected phone model. This feature only works with themes versions supporting PNG files. Import resources. This feature is used for import of a collection of image files from a selected direc-tory into the current theme. If some images are missing or are not correctly named, a dialog lists files that are missing for a complete theme to be created. This feature is primarily used for reimport-ing files that was exported as “empty resources” and then “filled” with graphics. List missing elements. This feature allows the user to quickly find out if image elements/patches or sound files needed to make the current theme complete, have not yet been imported to the current theme. The Sony Ericsson Theme Creator software seems to be old or discontinued. If you need more information please contact the developers of Sony Ericsson Theme Creator (Sony Ericsson Mobile Communications AB), or check out their product website.